About a week ago, most of us were all agog over ballot boxes, indelible ink that may/may not have been washed off, and electricity issues. Despite it being an incredibly exciting time, there were some of us who’s minds were on entirely different things – like saying “I Do”! If you guessed that it was one my pieces, well, you got it right! 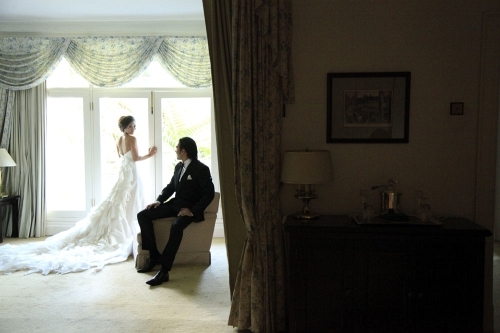 I’m so glad that I could see my work being enjoyed by a very attractive couple on their special day. An incredibly dapper groom, with his equally stunning bride! A very artsy shot, with just the right amount of retro thrown in for good measure. The tabloids were full of articles about the couple’s wedding, awash with photos of the film/tv star/host (you may remember him in the adrenaline-filled Fear Factor, rushing about to dig up his partner and handle live snakes) and his beautiful bride. 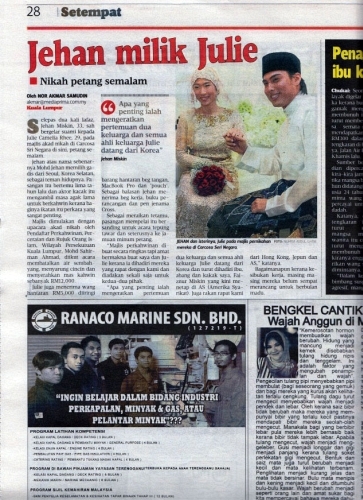 Here in the Harian Metro, you can see the couple looking demure in their traditional Malay suits. A huge and hearty congratulations to the lovely couple, for successfully tying the knot! Many thanks for allowing me to be a (small, very small) part of your unforgettable experience. Here’s to a wonderful and fulfilling marriage. Cheers!